My oldest son has always been a huge fan of construction trucks; excavators, loaders, dump trucks, cranes, etc. He LOVES trucks and there have been so many wonderful books that we have read over the years about them all. Though he is almost 12 years old now he still enjoys picture books about trucks (good thing too since they don't make chapter books about them!). 1. I'm Dirty-- We enjoy most of these books by Kate and Jim McMullan. This backhoe is busy clearing up a junk site and boy does he get dirty! 2. Good Morning Digger-- We read this book so often that I can still recite parts of it from memory! One boy watches the construction in his neighborhood as a new community center is being built. 3. The Diggers are Coming -- Ian just read this one last week. Step by step building of a new housing development this book is filled with trucks and workers. 4. The Construction Alphabet-- This book has a good paragraph on each page depicting a letter of the alphabet and a tool used in construction. The illustrations are lovely and they give a bit more detail about how each tool is used than other alphabet construction books. 5. Building with Dad-- My favorite book in this list! I just loved everything about this book from the beautiful illustrations, to the story of a boy watching his dad build his new school, to the fact that the book opens at the top! 6. 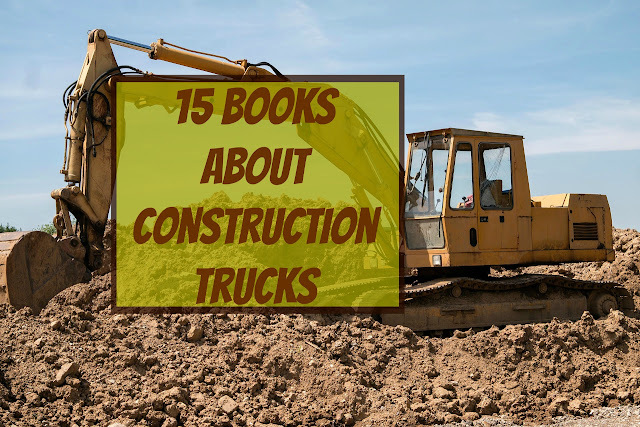 Construction, Roadwork, and Demolition-- These three books are part of a wonderful series taking readers through all the different uses and trucks used in constructing, building roads, and demolishing buildings. 8. Road builders-- Follow a road crew through their job of repairing roads and see many other cars and trucks along the way. 9. B is for Bulldozer-- This fun alphabet construction books takes the reader through the development of an amusement park. With a simple rhyming text it's fun to read. 10. Build Dogs Build, Dig Dogs, Dig, and Work Dogs Work-- These books are fun and a new series we've recently stumbled upon. Follow these hard working dogs through construction, demolition, and working days. 11. Dig!-- Join Mr. Rally and his dog Lightening as they work all day in their backhoe completing the five jobs they have for the day. 12. Machines at Work-- With simple illustrations and just a few words on each page this book was my sons favorite book as a toddler. He had it completely memorized in no time and just wanted us to read it over and over and over again. 13. Who Made This Cake?-- In this delightful story little men work with big machines to make a very special birthday cake for a little boy who just loves trucks. 14. Digger Man-- One little boy dreams about what it will be like when he's grown up and becomes a "digger man"
15. Boom! Bang! Roar! A Busy Crew of Dinosaurs - Combining trucks, a construction site and dinosaurs this book is sure to be a hit! Watch how this crew put together their building. One or two of these books were around when my twenty-somethings were little boys, and with four boys I can remember ransacking the library to find good books for little tough guys. So thankful that my grandson will have better book choices! They really have come a long way; even just in the last 10 years since I started looking with my guys. What a great list! I'll definitely be getting some of these from the library. We really loved "Building with Dad" too. Another of my son's favorites is "Goodnight, Goodnight, Construction Site" by Sherri Rinker - you might want to check it out! We have read that one too and it came in as a close tie for number 15! Thanks for the suggestion though. ... forget that is... I realized it may have sounded like I won't link up and that was not my intention at all. This post reminds me of an older book called Mike Mulligan and His Steam Shovel by Virginia Burton. My kids always enjoyed it. :) But these books you share also look like fun books for kids. I'm visiting from #LMMLinkup. Yes, we read Mike Mulligan too! Thanks for stopping by to check out my list. Great list too. I agree with others and enjoyed reading your post at the #LMMLinkup this week. I hope you will be a regular. Oh I remember the construction vehicle phase well. There was another one I really liked, but cannot remember the name right now. Ugh! Hate it when I do that. My oldest son is always looking for new books; it's getting much harder the older he gets to find good, meaty, construction vehicle books. We like the buldoze your way across Canada book. My little boy loves trucks and trains so much! I haven't heard of that one... we're going to have to look for it! Awesome selection of truck books :) Thanks so much for linking up at #familyfriday we appreciate it! We hope you come back next week. Thanks; it only took us 6 years of research to make sure we read every truck book out there! Thank you for linking up over at #bloggerspotlight link party. I will be featuring you for tomorrow's party. Hope to see you again..Pinned!